Front row from left: Ashley Creek, Abby Cole, Vail Smith, Sammi Ellsworth, Maddy Cole, and Kelly Lewis. Back row from left: Dakota Decker, Isaac Haden, Eli Keeney, Abagail Moncrief, Hannah Tillery. Not pictured: Anjeni Morrell. Twelve LHS juniors have been accepted to attend AL Boys’ State and ALA Girls’ State this June in Warrensburg, where they will experience governing and citizenship while operating their own city. 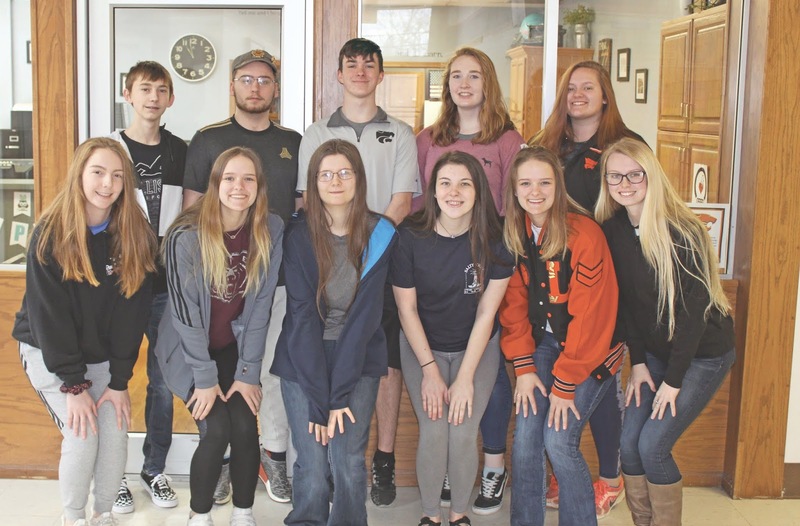 The American Legion and American Legion Auxiliary raise money every year to send high school juniors to Missouri Boys’ State and Girls’ State. This year, a very generous donation was received from the Licking United Community Help Center. Ed Folger stated that this donation made it possible for all of the students to attend. Everyone who supports the Help Center created this opportunity for the students with their generosity. All donations were necessary due to the number of students accepted this year. Other donors included Daniel and Cookie Hatch, Licking; Licking VFW Post 6337; Wilbur and Ruth Woods, Bucyrus; Friend Lumber Co., Licking; Jim Hagler, Licking; Jeff and Betty Goris, Licking; Holy Cross Lutheran Church Christian Soldiers, Houston; The Licking News; Licking MFA Exchange; Julius Inez Copeland, Licking; Sullins Gun & Pawn, Licking; My Storage Place (Ron Cook), Licking; and Woody’s Flowers, Licking. Special recognition should go to Joann Keeney, LHS Counselor, who identified qualified applicants and encouraged their participation including helping them complete applications. The American Legion and American Legion Auxiliary wish to thank the generous donors and the community for supporting the development of these future leaders.